than their share of growing hair dolls was Uneeda. Here is Miss Deb (who came in many types of boxes). Here is Miss Deb in one of her many different outfits. The Uneeda dolls that grew hair had an interesting hair-growing mechanism. The base of the ponytail was anchored to the inside of one of her feet. There was also a bead attached to this part of her ponytail. When one pulls the bead outside of the head, it slides over a slot. The ponytail then stays "long." Slip the bead out of the slot and the elastic pulls the ponytail back into the head. This way, her growing hair was either long or short. There were no in-between hair lengths. Another Uneeda doll was Magic Meg, who also came in many different outfits. Her hair operated the same way as the other Uneeda dolls. More Meg dolls in different outfits. Uneeda made other hair-play dolls. This one is called Missy. She has a huge hank of hair rooted at the top of her head. It does not grow. 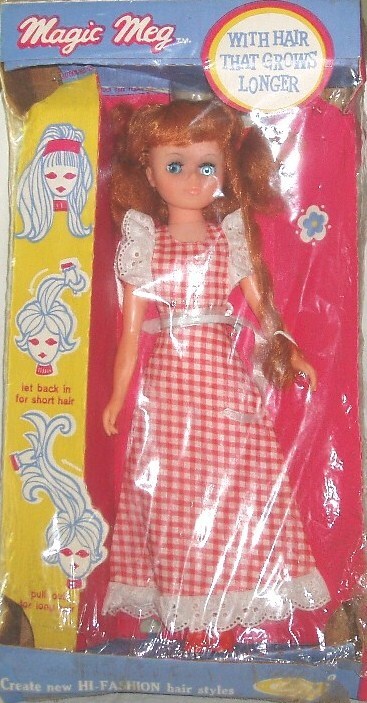 The doll's box made a real big deal of the fact that her hair could be styled in many ways. demonstrating how her hair could be styled. illustration on the other side of Missy's box remind you of?! Here are 5" Dana and Kim! They were also Uneeda dolls. Even though they are identical, they had different names. There were several outfits available for Kim. Here is the back of the outfit package. Here is Uneeda Kim in her case. Inside the case, there is room for three dolls. 26" Uneeda Miki was a pretty girl. As usual, her hair functioned as all Uneeda growing hair dolls did. Miki came in other sizes too. Here is the 31" Miki. Miki also came in a 5" version. The inside of her case held one doll, several outfits, had a small area to hold the clothes on hangers, and a pull-out drawer to hold her shoes, jewelry, and accessories. There were so many "sold-separately" outfits for Miki that one could really amass quite a large Miki collection! Another Miki in her case. What a super cute pixie face! A somewhat "mature" body for what is clearly a little girl doll. Her crudely drilled speaker holes on her chest. Markings that are found on her speaker, which we think may be made by another company and provided to Uneeda for this doll. This is the only markings found on the doll. Being such an unusual doll, it took the united efforts of the Yahoo Crissy Doll Club to figure out who she is (maybe). 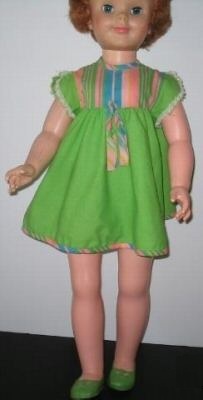 Based on the shape of this growing hair doll's body, we are pretty sure that she is a Uneeda doll. Also, her growing hair feature is identical to Uneeda's highly copyright protected growing hair function (see the New page for further clarification on that). But we still are not absolutely positive on her ID. Why? Well, she is not marked at all with any of Uneeda's usual doll markings. However, this is not unusual for a Uneeda doll that is a special issue to be sold in a special situation. Now you are surely wondering what that means. Uneeda sold quite a few of it's "Jennifer" dolls through the Wards catalogs. Most of these dolls weren't marked, but sold on a store shelf, they were marked with Uneeda's marks. They also created exclusives for stores like Western Auto and some grocery chains. So it is conceivable that this doll could be made by Uneeda but sold unmarked. Her original dress probably looked alot like this one. She is a big girl! She is 31" tall. She talks (perfectly I might add) in addition to growing hair. She has been redressed in appropriate clothes made from a vintage doll pattern of the era, with some vintage fabrics too. Even her barrettes were purchased on eBay in a lot of old hair doo-dads. We love her!